FASHION moguls have decreed that the boyish figure is passe, and that graceful curves are to be the coming mode. 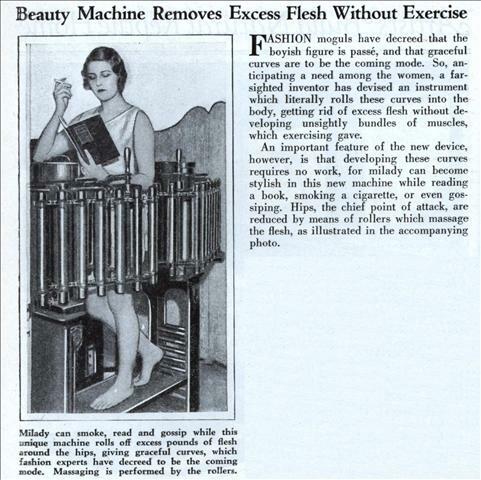 So, anticipating a need among the women, a far-sighted inventor has devised an instrument which literally rolls these curves into the body, getting rid of excess flesh without developing unsightly bundles of muscles, which exercising gave. 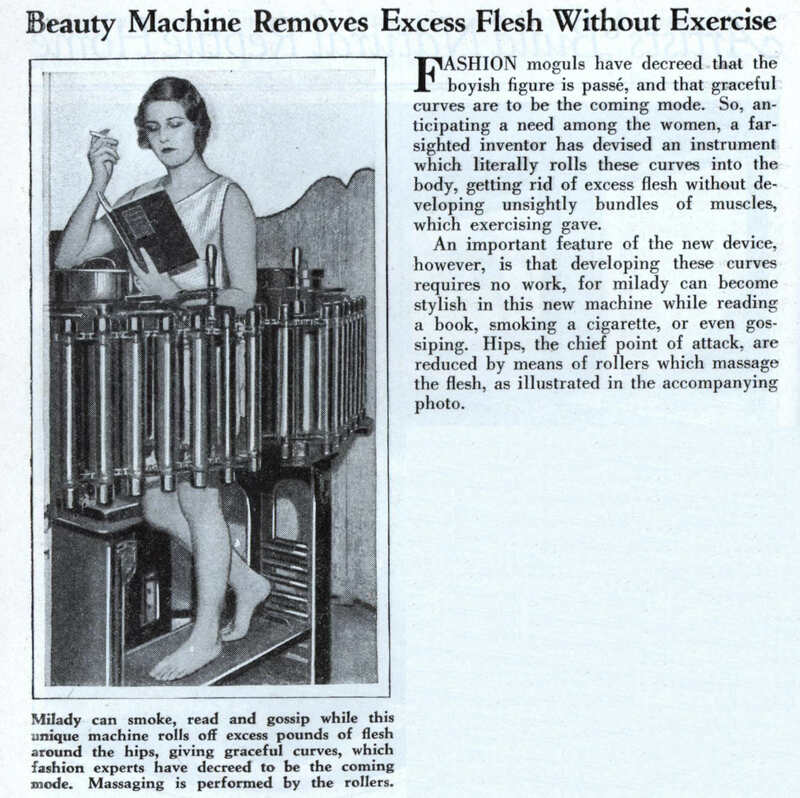 An important feature of the new device, however, is that developing these curves requires no work, for milady can become stylish in this new machine while reading a book, smoking a cigarette, or even gossiping. Hips, the chief point of attack, are reduced by means of rollers which massage the flesh, as illustrated in the accompanying photo. This article makes no sense (aside from the fact that the machine doesn’t work and that you can’t change your basic body structure). First they tell us that the boyish figure is out and the feminine figure is in, then they show how this machine will whittle down the hips. A feminine figure has a narrow waist and relatively wide hips. If you want an hourglass figure you want to reduce the waist, not the hips. Can you imagine trying to gossip to a friend while she’s standing in this ridiculous contraption? What I find most sad is ridiculous body advice like this is still around… and probably will be forever. This kind of stuff will always be around — as long as there’s a buck to be made selling it . . . . Rotating knives would do a quick job of removing extra flesh. 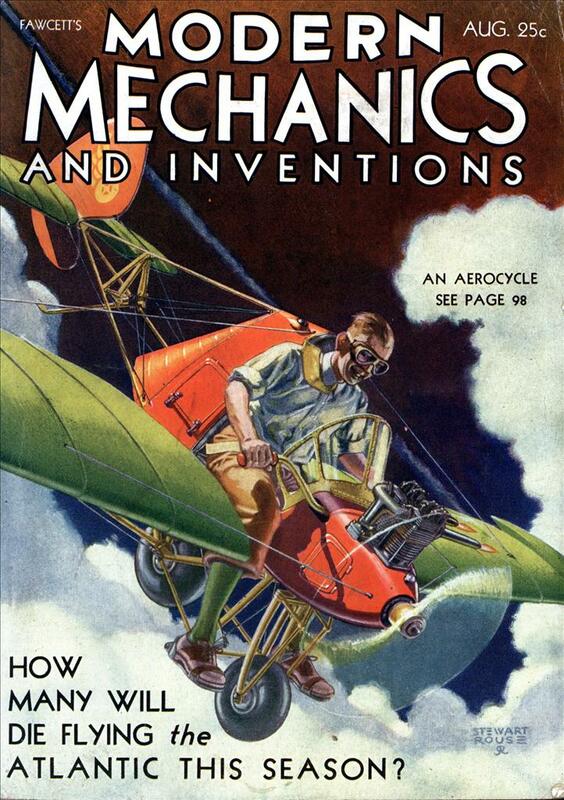 Ah, the early 20th century. When smoking was a relaxing respite and exercise a menace to be avoided. Anyone know what this might be worthto a collector? Reading a book & smoking a cigarette. That’s the kind of exercise I like.